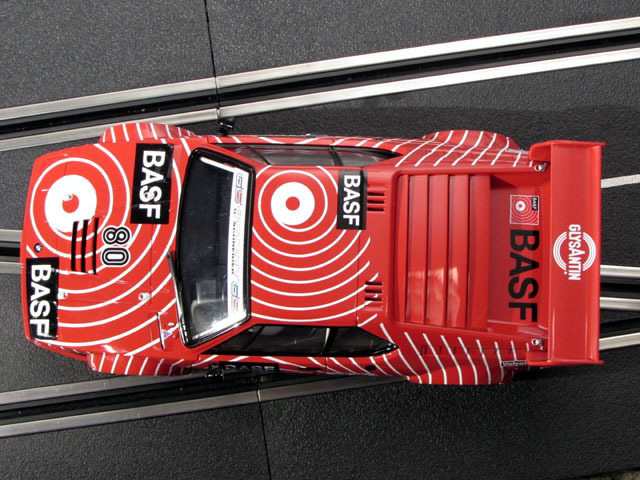 While the BMW M1 didn’t make a huge impact on the racing world back in the late 70’s and early 80’s, the looks of the car and the drivers that raced them left a small mark in the racing history books. 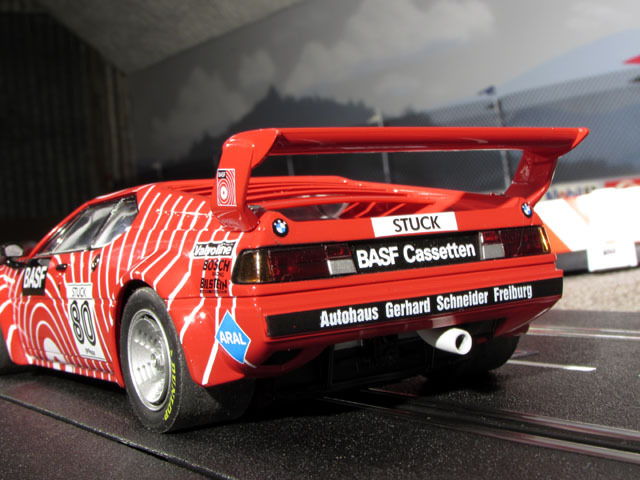 BMW hoped to compete with the Porsches of the day, but failed to succeed. 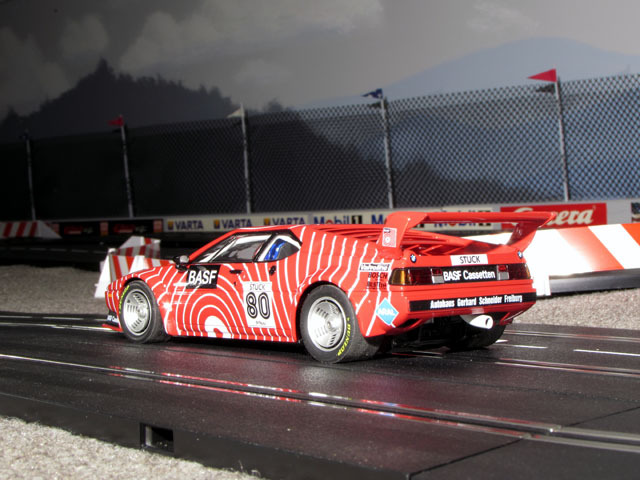 While the M1 wasn’t much of a race car, it is hard to not do a double take at the body design and eye-catching liveries they donned on the race track. 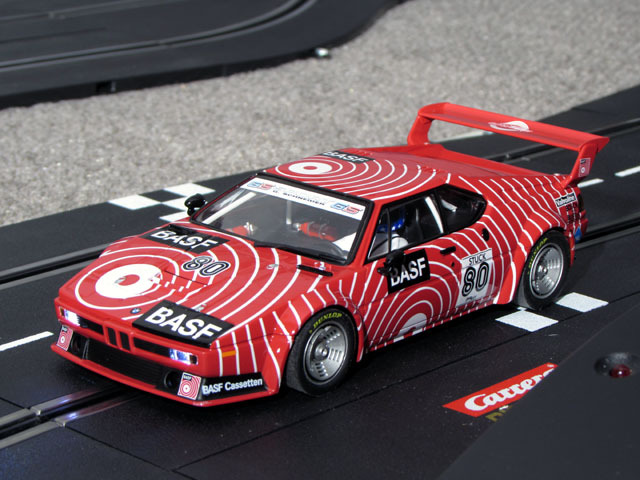 We’ll take a look at Carrera’s version of the car driven by Hans-Joachim Stuck in 1980, Carrera D124 BMW M1 Procar BASF, No.80 (item #23821). 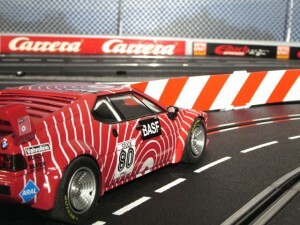 For those with experience racing Carrera slot cars, the fact that this car looks great is no surprise. While there may be a sponsor logo missing here or there for licensing reasons, the artwork that is present is clear, crisp, and brightly displayed. 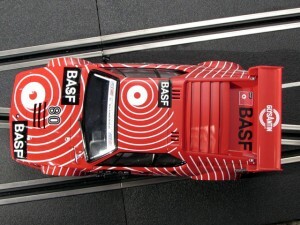 Although with the BASF livery, you may have to give yourself a shake to snap out of the trance you’re in created by the red and white paint scheme! I don’t want to jump ahead of myself, but when taking photos for this review, I happened to notice something that, while it makes no difference to the performance of the car, it does show just how detailed and to scale Carrera slot cars are. 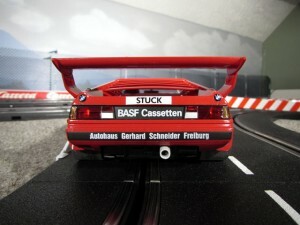 So imagine yourself following this M1 down the racetrack just hoping to get to the inside of the next turn. Too bad you won’t be able to because Hans sees you in his rear view mirror! Look closer! Speaking of Mr. Stuck, the other details in the cockpit are impressive too! 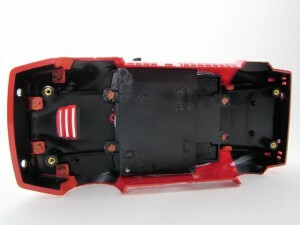 Looking at the underside of the car shows the guide setup that has become the standard on Carrera D124 cars, which includes a double braid system to insure good contact to the track while racing. You’ll also see the small, white dip switch that changes the car from digital to analog, as well as the IR sensor for digital operation. One other thing to notice is the part number stamped on the bottom of the chassis in white, in this case ‘23821’. 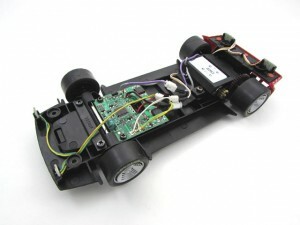 Removing the body from the chassis is quick and easy by way of four screws, two near the front and two in the rear. With the body removed we can see the simple wiring that is nicely routed to and from the digital chip. 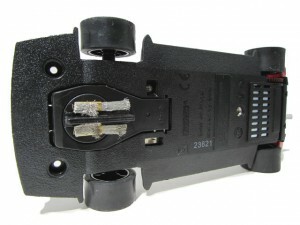 The front and rear lights are each on separate boards and are held in place by housings made into the chassis. 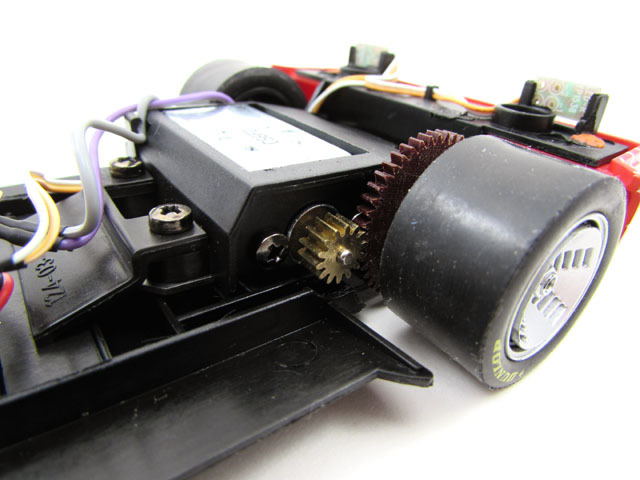 Taking a quick look at the parts that make this car go, we see the standard motor and gearing from Carrera, a 14 tooth brass pinion on the motor shaft and a 50 tooth spur gear on the rear axle. This gear combination give us a 3.57 gear ratio which is a nice setup for good top end speed as well as some quickness out of the turns. The half tray interior can be seen from the underside of the body as well as the mounting posts with threaded brass inserts and blacked out areas that prevent light from showing through the red body where it isn’t wanted. Now that we have taken a look at what makes this car not only look great but run great, let’s talk about how it runs on the track. 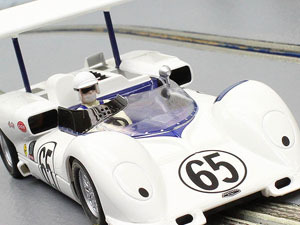 Since the majority of folks that race slot cars do so with a car that is unmodified and raced on a plastic track, that’s how I did the testing for this review. I removed the car from the case, made sure everything moved freely, checked that the tires were on the rims correctly, and began testing. Right out of the case the car was smooth and quiet. All the lights worked as well as the digital functions of the electronics inside the car. 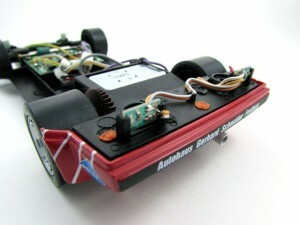 The tires have sufficient grip and with help from the single bar magnet located just forward of the motor, the car zipped around the turns with ease. 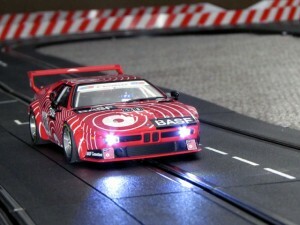 While the Carrera D124 slot cars are quite heavy compared to most cars that are geared to organized racing, this BMW has no problem going from zero to fast. 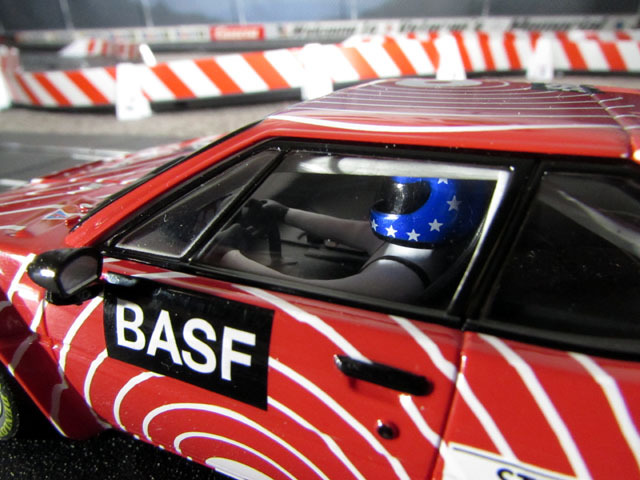 Throttle response is very good between the controller and the car. Braking (completely letting off of the plunger of the controller) nets a stop in less than 24”. The combination of acceleration and deceleration makes for a very responsive car in both the straight sections of track and the twisty technical sections too. 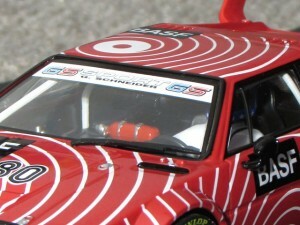 As with all of the Carrera D124 cars that I own, this one performs well. The quality is top notch in all areas and one would be pleased with adding this one to their collection. For those that are interested in scale racing, the Procar series was limited to the BMW M1 so your only option for a competitor car is the other livery of this same model that was just released, the Regazzoni, No.28, 1979 (item #23820). There are two more BMW M1’s scheduled for release sometime this year though, so a nice lineup of four of these cars racing around the track will be a great sight to see! 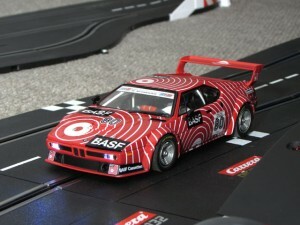 You can see all four liveries being offered by LEB Hobbies HERE. Grab an M1, or two, and enjoy some friendly competition on the slot car track! 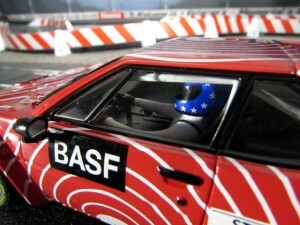 And remember, when racing slot cars, if you’re not having fun you’re doing it wrong. 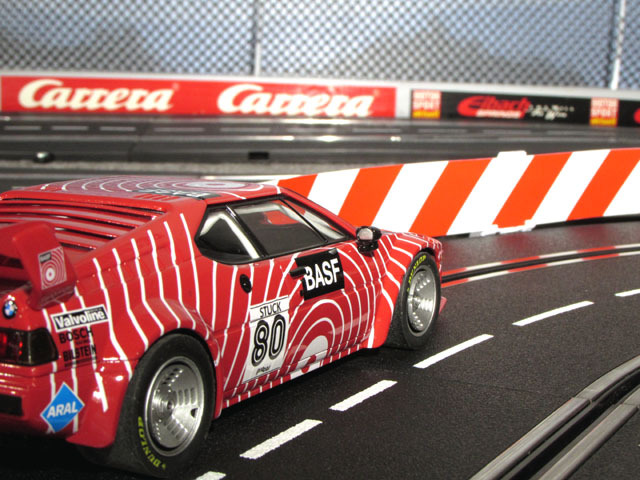 This entry was posted in Product Reviews, Slot cars and tagged buy slot cars, Carrera Digital 124, slot car racing, slot cars, slot cars for sale, where to buy slot cars on March 5, 2016 by admin.